1Br with 1 Full Bath, Laundry & Garden sleeps up to 4. Best for couples. Stay in Williamsburg NYC's sunlit bedroom apartment opens up to a private garden space to be used by guests only for quiet enjoyment (please no gatherings). There is a Queen bed and tv. The closet and armoire provide ample luggage storage. A dressing table and full length mirror are provided for convenience. The living room/dining area has two convertible sofas (memory foam toppers) and a dining set for four. Newly renovated, fully stocked kitchen and washer/dryer. Full bath, tub and shower, washer/dryer. Plenty of fresh towels and linens, 1875 watt hair dryer, complimentary hotel toiletries. 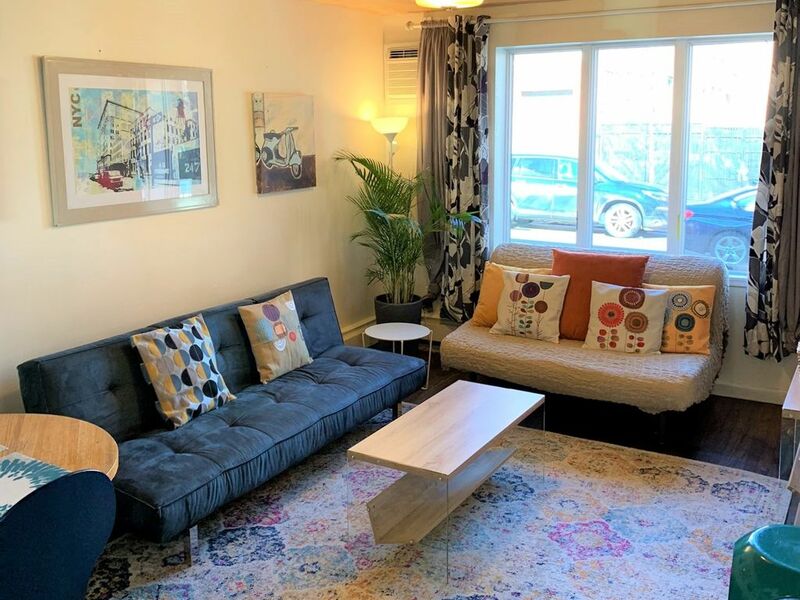 Included: Fastest available Hi-speed WiFi FIOS, stereo (CD player, iPod connection), Flat panel TV with 200+Verizon FIOS channels. Family friendly. Children's playpen, stroller, toys and childproofing by request. Rates are for up to 2 guests. Additional rate is $10 per day per guest. Children under 12 free. Max 4 adults. For shorter stays (2-3 nights), we only book up to 3 months in advance. IMPORTANT TO NOTE: We check Photo ID of the card holder used for booking upon arrival, so please make sure that the CC holder is present at check in. OTHER REQUIREMENTS/RULES: Must be at least 25+ years of age to rent one of our units. First offense of loud noises or if you are caught throwing a gathering that includes more than the party registered with the reservation will result in an immediate removal from the property from authorities, and you will not receive a refund for any remaining nights (if any) left on the reservation or your security deposit. Check Out Other Listings: (listing #1290336) HomeAway (Listing # 3565575), and HouseTrip (Listing #224744). An oasis of peace and quiet in the heart of Williamsburg. Located on a tree-lined residential block, our property boasts a lovely seasonal garden for guests to enjoy. Come back from the noise and crowds of Manhattan to relax in serenity. Inside apartment, laundry soap included for your convenience. Verizon Fios high speed wireless internet. Verizon Fios high speed wireless internet fastest residential speed available. NYC tour guide books, maps, coupons, local recommendations. Selection of Fiction/Non-Fiction books and magazines to enjoy. HDMI cord for television. Automatic drip coffee maker with filters. We also have a small French Press available to your convenience. basic staples like tea, sugar, cooking oil, salt/pepper, etc. We have Verizon cable TV with all popular channels. Cable television with over 200 channels, On Demand movies available at extra charge. Selection of Fiction/Non-Fiction books and Magazines to enjoy. Age appropriate selections of birth to 7 years. Stroller and high chair/booster seat attachment are also available. Great location for our visit. This rental worked great for us. It was very close to the Wythe Hotel where our daughter was married. The neighborhood was fun to explore with lots of restaurants and shops. We walked to the Brooklyn Bridge, ferry and Transit Museum.The rental unit was easy to access with the door codes. Apartment size worked well for three of us. The water in the shower was warm immediately and had great water pressure. Kitchen and bath were adequately equipped. There was street noise for the person sleeping in the front area. Overall great experience. The apartment was very clean. We enjoyed having the backyard, great place to relax after walking all day! We loved our stay in Williamsburg!! Amazing property with great outdoor space in fantastic location. As a family of 4 we stayed here for 5 nights to use as a base for visiting New York. The apartment was very clean and adequately equipped. The location was amazing in a trendy neighbourhood with great cafes and restaurants, and only a 15 min subway journey to the centre of Manhattan. The outdoor space with table and chairs was a great bonus which we used for breakfast and last thing at night after a hectic day of sightseeing.. This place was perfect for our visit to Brooklyn. I would have given it five stars, except for the fact that the internet was spotty at best. Also, cell phone service inside the apartment was hit and miss and we needed to go into the back yard to guarantee a solid connection. Other than that, it was great. The apartment was nicely furnished. The bed was comfortable and our adult daughter slept on the living room couch with no complaints. The kitchen was adequate for our needs (coffee and toast in the mornings). We ate the rest of our meals out. There were plenty of towels in the bathroom. The shower worked well and the A/C in the living room kept the place cool on the couple of really hot days we had while there. There are many good restaurants and bars within walking distance. The “L” train subway entrance is 21/2 blocks away, however that will be closing soon due to reconstruction of the tunnel under the East River. The “J” train is only a 10-15 minute walk away. We really enjoyed our time in this unit and hope it will be available next year when we return to visit our son. Cute and cozy in the middle of everything! My husband and I stayed here while attending a wedding at the Brooklyn Winery. It was the perfect location! Less than 3-4 blocks from the reception, wedding and rehearsal dinner. The owner was helpful and friendly and the garden was beautiful. Williamsburg is the artistic heart of Brooklyn. Often featured in film and television, it is a bustling neighborhood filled with fashionable boutiques, art galleries, performance spaces and movie theaters. Williamsburg is fast becoming one of New York’s dining hot spots, with restaurants in every price range featuring all types of cuisine. A short walk away from the apartment is McCarren Park, a large multi-block outdoor space with a playground, running track, skate park, basketball & tennis courts and lots of space for simply relaxing and people watching. From late June to Labor Day the newly renovated Olympic-sized McCarren Pool is open every day and free to all. The waterfront/ East River Park is also very close. It is home to the popular weekend festivals Smorgasburg (food) and Brooklyn Flea (flea market & food). Also at the waterfront is the New York Waterway Ferry - for a scenic trip to lower Brooklyn, Manhattan, or Governors Island* (*seasonal). Bike rentals (daily, hourly) are available nearby from Citibike kiosks and private dealers. North Brooklyn and all of New York City have miles and miles of newly updated bike paths. Helmets available upon request! Travel to and from the apartment is very convenient. The Bedford L Subway Stop (first stop in Brooklyn) is less than 5 minutes away. 10 minutes to Union Square. 25 minutes to Times Square. Trains run frequently. The stop is well-lit and very well traveled- safe to use at all hours. Taxis and Car Services are also readily available. Excellent Sushi and Japanese fusion cuisine. High quality beef for non fish eaters. Fun cocktails and a happy hour menu. Best fresh baked bread only $3-4 dollars a loaf. My favorite is the 7 grain bread or the Health Bread. They also have good baguettes, pastries, cakes, coffee and Polish food to go. A neighborhood favorite. It fills you up! The best meatballs & pasta, kid-friendly. Rates are for up to 2 adults per day, $15/day each additional, children under 12 stay free. $75 cleaning fee. $250 damage/security deposit.